People notified of a data breach were nearly 11 times more likely to be victims of fraud than those who were not notified. Anyone can become a victim of identity theft due to a security breach. And identity theft can cause real damage to your finances and credit. Lifelock® protection sends Breach Notifications to inform you of publicly reported larger scale security breaches and stolen credential events so you can take action to help protect your personal information. ** LifeLock searches for over a trillion data points daily looking for potential threats. If your identity is ever compromised, LifeLock’s Restoration Specialists will take charge and spend up to $1 milllion to hire experts to help your recovery. Save Money While Protecting Your Identity! 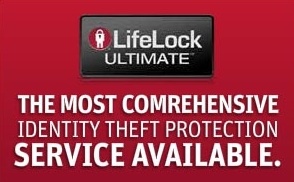 Sign up for LifeLock Today and Save 10% Off for the First Year. Take advantage of this offer and you and your family will be thankful for your privacy, safety and security!